Do you ever go through these phases in your blogging journey where you just don’t know what to write about? You want to update your blog, but, can’t think of a topic that you feel like writing on? So how do you find your muse then? How do you find a topic that inspires you to write? How do you get those creative juices flowing? I’m sharing below a few sources of blog content inspiration that I use for finding new post ideas for my own blog. There are so many posts on this blog that have happened because of something I read/saw on someone else’s blog. Sometimes you want to agree with another blogger’s post, adding your own points in favor. Sometimes, you want to disagree with something you read, and you give your reasons for that. Sometimes, their experience reminds you of a similar experience you might have had. Occasionally, one of my readers would say or ask something in the comments that would get me thinking. And then I’d write a post around it. Sometimes, they mention something so witty or humorous or even informational, that I feel like sharing it with the rest of my readers too. Phone conversations. Face-to-face conversations. Email/chat conversations. Discussions on Twitter, Facebook, and even LinkedIn these days. All kinds of conversations have found their way into my blog posts. Sometimes, of course, your conversations can be specifically for brainstorming. I don’t check the data from Google Analytics too often, but, whenever I do, I’m amazed to see the variety of search phrases that bring readers to my blog from Google! Occasionally, I’ve written a post or two on some of the phrases that “clicked” with me. You can use these search phrases to find out what exactly readers in your industry/niche are looking for. Google Alerts is one of the lesser known tools for finding new blog content ideas. It is actually very simple to use. 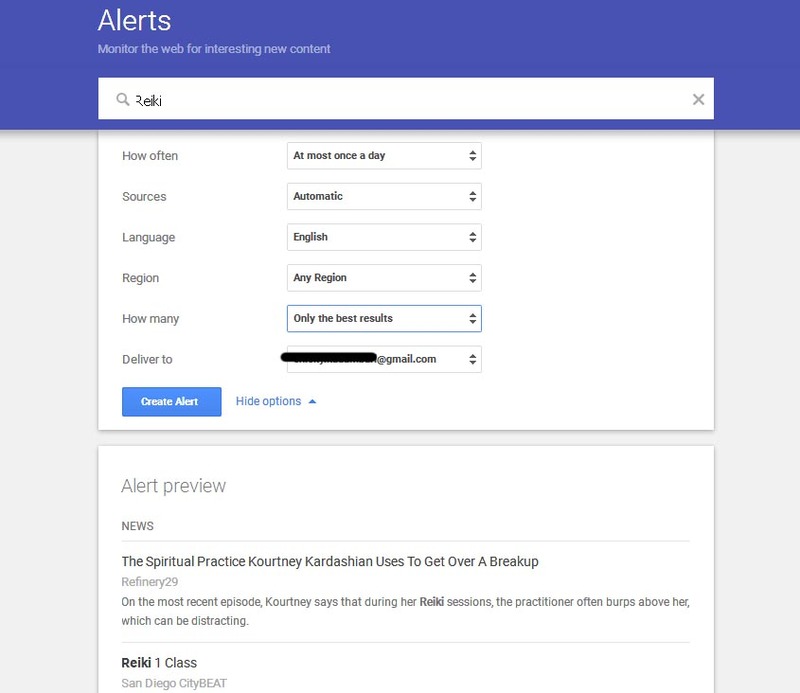 Just enter your keywords and some other details in the form, along with an email ID where it should send you the alerts, and you're good to go. You get to know what others are writing about in your niche. And you can take inspiration from there. What's being shared the most in your niche? What kind of topics? What kind of headlines? Even what kind of supplementary images? Yupp, I take a mental note of everything. I'm always collecting ideas from the social media - Twitter Discover, Instagram Explore, Google Trends. If you are active on Pinterest, you can also check out what's popular there. Questions asked by real people. Most industries have dedicated forums where people put up their questions to other experts in the industry. A lot of good post ideas can be discovered on such forums. Also on Quora, nowadays. I have a separate niche blog on Reiki, and I have discovered that I can simply go once a week on Quora, and collect a whole bunch of post ideas for the entire week, based on actual questions people have asked about Reiki. Randomly browsing through my own old blog posts often gives me ideas for new ones. Plus, there is always some content on our blogs that is evergreen. You can freshen it up, add to it, maybe make a mini series out of what was published earlier as a single post. Or you can even change its format. For example, you could convert a lengthy text post into a 2-3 minute long video. Or you could make a list post linking to several older posts around a similar theme. Like I have done now. Divided my blog into seven main categories and fixed one weekday for each category - MindfulMonday, TenOnTuesday, WorkspaceWednesday, and so on. Having a theme always makes it easier to produce fresh content, 'coz you have a "life-line", so to speak. Something to guide you. Plus, your readers also know what to expect from your content calendar at any time. So it works both ways. Sometimes, you don't need to create content from scratch. You can simply offer a collection of useful links to your readers, on a specific topic. For example, roundup posts from multiple food bloggers, on say, "Christmas Recipes". Or a list of "ideas for recycling glass jars" from different DIY bloggers. This is also a kind of curated content, in that other people are providing information for your post. I have used this method only once so far, but I have seen some of my blog buddies use it very regularly and quite successfully. 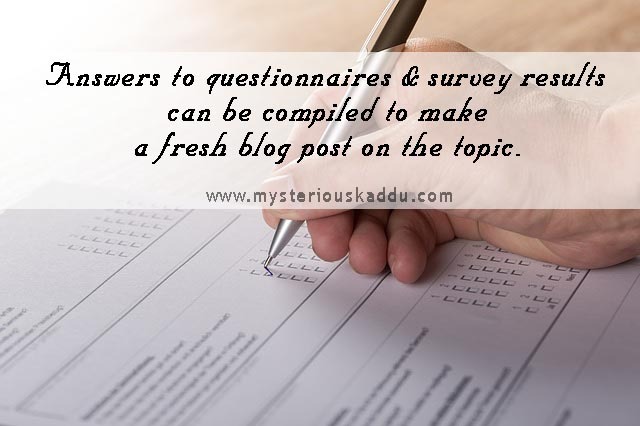 The polls or surveys can be done publicly on social media sites, like Facebook or Twitter, or anonymously through Google forms. And then the results/answers are compiled in a blog post on that topic. For example, I could have done a survey for this post's topic too - "How to find new content ideas for my blog?" - and then I could have collected and summarized everyone's answers into a final post on this subject. If nothing else works, or you just don't have the time to create new content, you can always ask other bloggers in your niche to do a guest post on your blog. You get fresh content for your blog, and they get a back link to theirs. Plus, they get exposure to your blog readers too. I love books and English movies. So I can always find inspiration for new blog content from them. Quotes, lists, lessons, any number of post ideas. But you could be a TV buff. Or perhaps a music addict. Makes no difference. Content always inspires more content. Time off from my computer. A walk around my building perhaps. Time spent with some kids. Going on a cleaning spree in my house. Or cooking. Or even shopping. (Even though I still hate shopping. Although online shopping sites have made my life a little bit easier.) But really, anything can ignite that spark, you know. Personally, I get some of my best post ideas in the shower! Inspiration can hit anytime, anywhere. Literally. And if you don't capture it right away, then it's gone. I speak from experience. Eventually, I started keeping an idea journal. At first, I just saved the ideas into a Draft post in my Blog Dashboard. But, as the list grew longer, I realized I needed some sort of organization. So I made an Excel sheet. I keep collecting topics, headlines, quotes, questions from Quora, snippets from other people's posts, even some of my own comments on others' posts! I also have a dedicated folder for "Post Ideas", in which I save longer sample content, images, infographics etc. These are my top sources of inspiration for developing blog content. 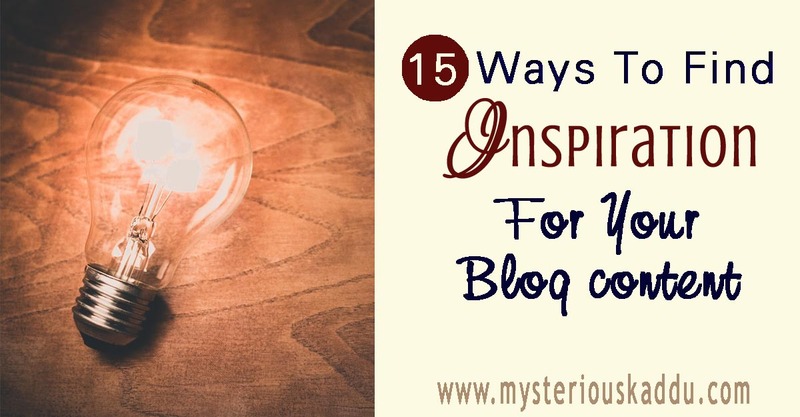 I usually find new blog post ideas in one of these 15 places. The best thing about blogging is that once you get in form, the ideas keep coming without much effort on your part. The more you blog, the more you want to blog. It becomes like a cycle. 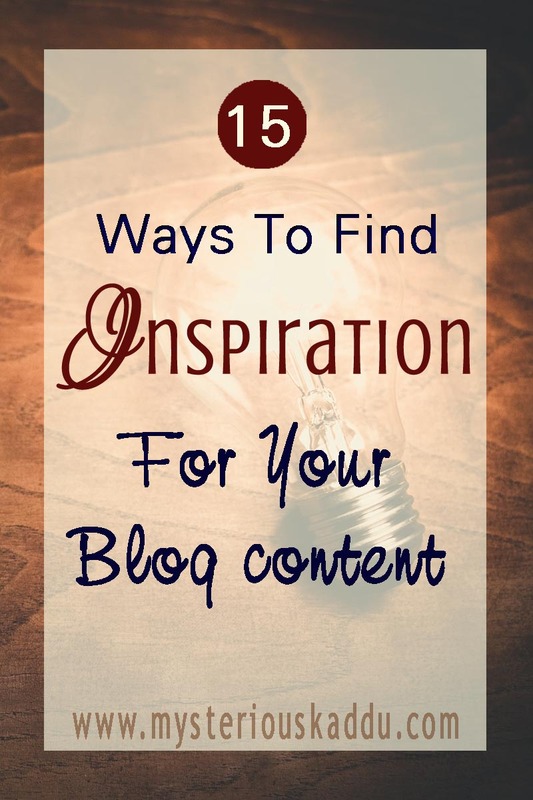 Do you also use any of these sources to find inspiration for your blog posts? What other sources do you have for finding new content ideas to blog about? This is my ninth post for A to Z 2019. I use all of those that you've mentioned. Life itself it a great inspiration. I have so many ideas written down, I haven't yet had the time to blog about them all!! Thank you for writing this! Much needed. So - I had no clue about google alert lol! I will look into Point no 5 . I have never tried it. I look into newspapers for small news. Talk to kids in your building. they are a source of many innocent topics. Write for prompt (which I do) and read other posts too. Except for Google Analytics and Google Alerts, I have used all these ideas at some or the other time for my blog. Need to learn about GA from you one of these days. I have saved this page for my future reference. Normally I write about random topics or something that u feel strongly about. Your post has the trigger point for a range of ideas. Loved this. A simple and easy list of ideas, Chicky! Even using a few works wonders! Very useful post. I use each of these sources and more for blog post ideas. Lots of information in this post. Great suggestions for deciding on new blog content. I already use a lot of them, but next time I'm stuck I'll definitely come back to this post to get a reminder. <3. One of your best blog posts Chicky!Saving it for future. Each point is well explained. Also the concluding lines are so true - the more you blog, the more you want to blog!